Whether you're the older, younger, or middle sister doesn't matter - you've always had your sibling's (or siblings!) back. Sticking up for her when she was treated unfairly, sharing your snacks and/or best toys, letting her know if she has something in her teeth, etc and she's always returned the favor! 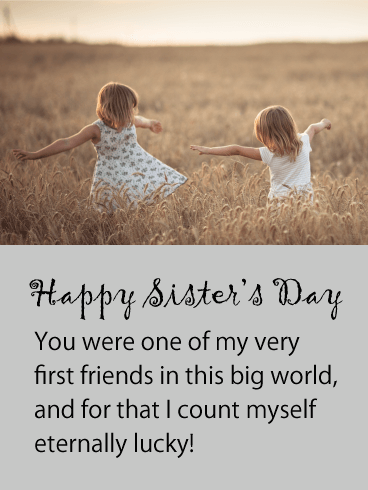 Let your best pal know how much you love them this National Sister's Day by sending them this sweet card. 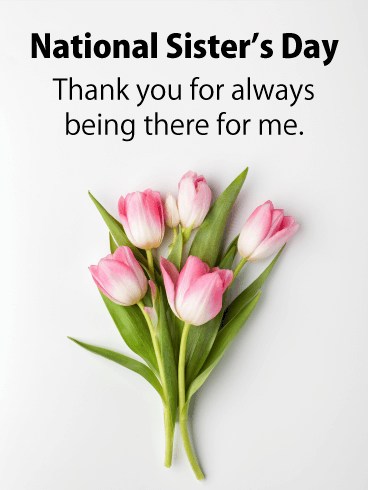 Does your sister spend most of her time taking care of others and helping them out? Is she impossibly thoughtful, empathetic, and caring? 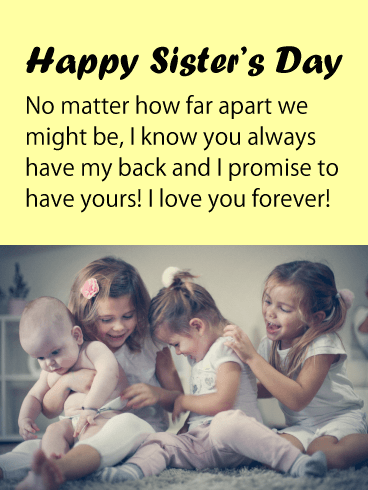 If so, this is the card you should send her for National Sister's Day! 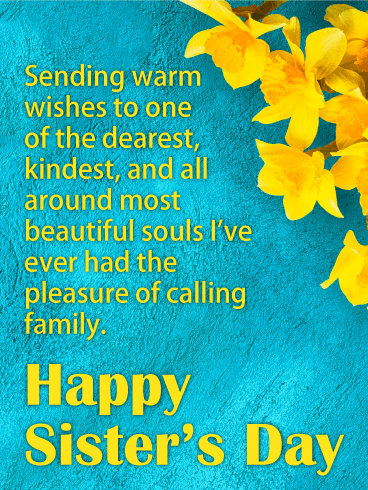 Let that compassionate soul know how proud you are to have her in your family with these gorgeous yellow flavors over a happy, blue background. While your sister may not be orange-billed, bright yellow-colored, or insanely fuzzy, she's still as cute as a baby duckling! 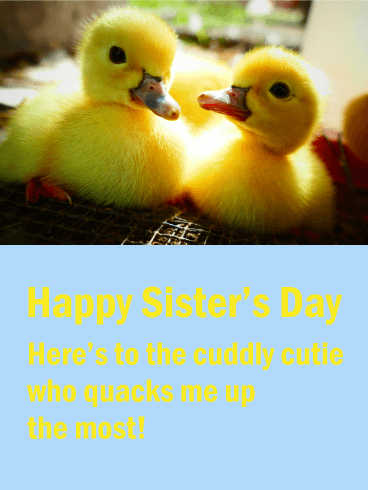 That's why you simply must send her this charmingly adorable ducky card for National Sister's Day! This card is perfect for that sibling with a good sense of humor cause the message is sure to leave her giggling or "quacking up" if you will! 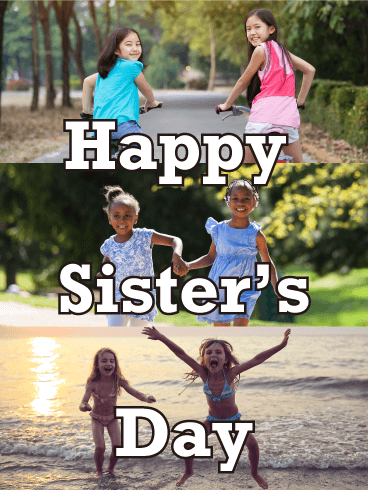 A National Day just for sisters?! You have gotta be kitten me! 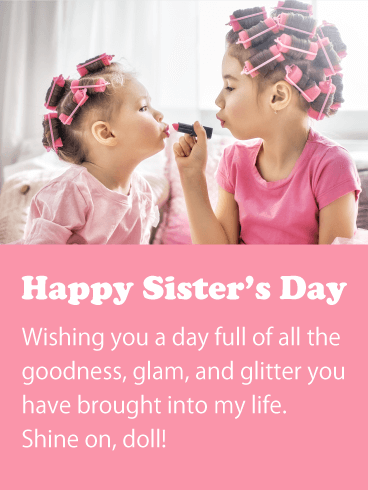 Obviously you have to send your own amazing sister a card in celebration! 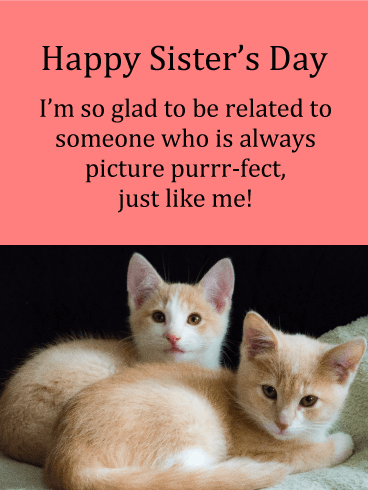 Send that selfie queen this purrfect Happy Sister's Day card with two very photogenic kitties! She's always been your best fur-iend fur-ever, the cat's meow, so you don't ever mind sharing the spotlight with her! Is your sister your ride or die? Your partner in crime? Maybe they followed you around like a puppy (or vice versa!) when you were growing up. Whether you shared your toys nicely or were fighting over them, life was always undeniably better when you two were together, yip yip! 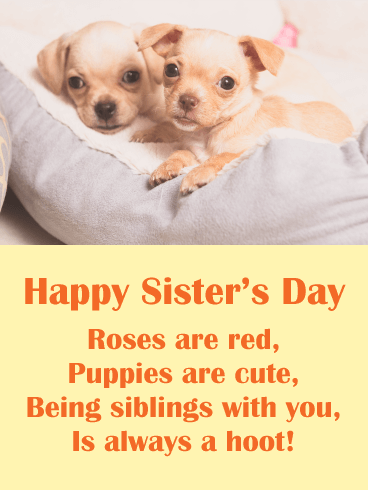 Send your stellar sibling this Happy Sister's Day card featuring cute, little puppies and a silly poem! Your relationship with your sister has always been a healthy one. Whether it was late night chats sharing bottles of wine, borrowing each other's good clothes for job interviews or dates, or simply calling to swap sound advice - you've been through a lot of life together! 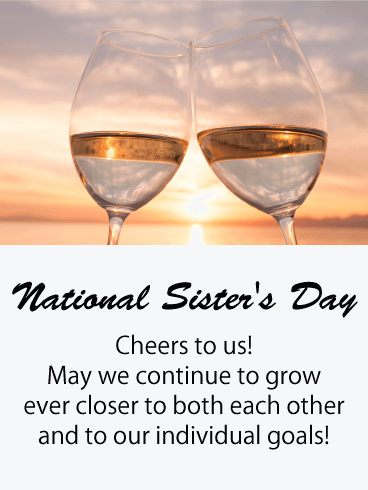 Celebrate that special bond by sending her this classy toasting glasses card for National Sister's Day!